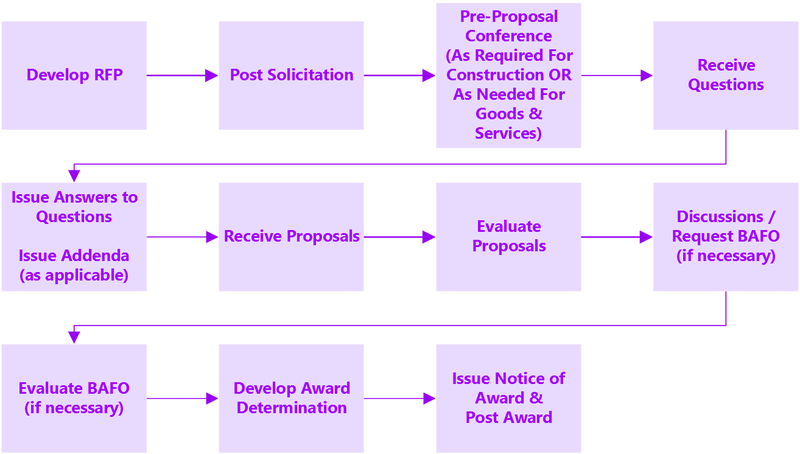 The Competitive Sealed Proposal process is outlined in the graphic below, and detailed in the following sections. GENERAL INFORMATION: Provide an overview of the procurement, including a brief statement about the intended procurement, a background providing important facts about the present procurement need, the procurement schedule, information on submitting solicitation inquiries, the pre-proposal conference, and other administrative information related to the procurement. SPECIFICATIONS/STATEMENT OF WORK: Describe, in general terms, the goods, services, or construction to be purchased. For more information on how to develop a Specification or Statement of Work, see Section 3.8. PROPOSAL PREPARATION AND SUBMISSION INSTRUCTIONS: Inform an offeror how to structure a proposal along with where to submit the proposal. This should include specific instructions on organization, the number of copies, signature requirements, page limitations, required attachments, bonding, etc. PROPOSAL EVALUATION AND AWARD CRITERIA: Provide a clear understanding of how the proposal will be evaluated and the procedures for awarding the contract including all evaluation criteria and point value for each. EXHIBITS, ATTACHMENTS AND TERMS AND CONDITIONS: Provide required forms to be completed by an offeror, additional informational reference documents, and the State’s required terms and conditions. To assist agencies in developing RFP documents, the SPO has developed an RFP Template. If the Procurement Team has developed a comprehensive Procurement Strategy Plan, including detailed scope and specifications, the template will expedite development of the RFP. Ideally, the template should provide the required content and components outlined above in an easy to use way for agencies to insert additional required elements and information. Internal approvals may be required prior to posting the Public Notice. Check your departmental procedures. The Procurement Officer should ensure that it receives all required approvals prior to posting the Public Notice. All RFPs shall be published for a minimum of thirty (30) calendar days between the first posting date and the date set for receipt of proposals, unless the Procurement Officer makes a written determination justifying that a shorter time will provide for adequate competition. All inquiries and government responses shall be provided to all potential offerors and should be issued by an addendum to the solicitation. Addenda are typically used to correct minor defects, and provide information or clarification to potential offerors. If the RFP must be amended, the impact to the potential offeror shall be considered, and the proposal due date shall be extended if applicable. Addenda should be published in the same location and manner as the RFP. It is the responsibility of the prospective offeror to keep current on any addenda and consider these changes in their proposal. In accordance with HRS §103D-303.5, a pre-proposal conference is required for all construction projects with a total estimated contract value of $500,000 or more and design-build projects with an estimated value of $100,000 or greater. RFP’s for goods and services and construction below the dollar thresholds above, may include a pre-proposal conference. Such events shall be specified in the RFP, including date, time and location of the event. Construction and design-build projects within the dollar thresholds, shall allow for a minimum of fifteen (15) calendar days between the date of the pre-proposal conference and the date set for receipt of proposals. This gives the purchasing officer time to make any required changes to the RFP, if needed, and provide the contractors adequate time to incorporate information learned at the conference into their proposals. Pre-proposal conferences for goods and services are optional. Upon receipt by the purchasing agency, proposals, shall be date and time stamped but not opened. Proposals shall be stored in a secure place unopened until the closing date and hour set out in the solicitation. After the date established in the RFP for receipt of proposals, the Procurement Officer and at least one witness shall open all proposals received as of the advertised opening date. Upon opening the proposals the Procurement Officer shall prepare a register of proposals which shall be made available to the public upon posting of the award. Any proposals arriving after the closing date and time are considered late and shall be returned to the offeror unopened. In order to guide the committee during proposal evaluation, please refer to your evaluation strategy plan developed during the market research phase, see Section 3.9. Following receipt of responses to the RFP, the proposals shall be examined for general conformity and acceptability or potential acceptability, in accordance with the RFP. Proposals shall be initially evaluated to determine if they are acceptable, potentially acceptable or unacceptable. If the evaluation committee determines there is a need for discussions, the evaluation committee will establish a Priority List of Offerors. Responsible offerors whose proposals are deemed acceptable or potentially acceptable are eligible to be placed on the priority list. If numerous proposals are received and the evaluation team wishes to establish a competitive range then the team must rank, at a minimum, three (3) responsible offerors in priority order based on the proposal evaluation scores. Only offerors on the Priority List of Offerors are eligible to enter discussions, receive further addenda to the RFP, and submit Best and Final Offers (BAFOs). Discussions are an exchange of information to promote understanding of a state agency’s requirements and an offeror’s proposal, and to facilitate arriving at a contract that will be the best value to the State, taking into consideration the evaluation factors set forth in the request for proposals. Although discussions are allowable in an RFP procurement, it is not required and proposals may be accepted on evaluation without discussion and proceed to award. Discussions are limited to offerors on the Priority List of Offerors developed by the Evaluation Committee. The evaluation committee chair must establish procedures and schedules for conducting discussions and keep a record of the date, place, purpose of meetings, and those attending. All priority-listed offerors shall be afforded equal treatment. If there are any substantial oral clarifications of a proposal during discussion, the offeror shall be required to provide the clarifications to the evaluation committee, in writing, in response to a request for BAFO. Once discussions are concluded, a BAFO request may be issued via addendum to the priority-listed offerors, requesting any changes to an offeror’s proposal based on discussions. To allow offerors to submit clarifications via their BAFO proposals. Overall, the BAFO is a good tool to ensure priority-listed offerors are accorded fair and equal treatment with respect to any opportunity for discussions and revisions of proposals. When the need for a BAFO arises, the BAFO addendum to the RFP will be provided to the Priority List of Offerors only. When issued, the Procurement Officer will establish a date and time for the priority-listed offerors to submit the response to the BAFO. Included in the BAFO, priority-listed offerors shall be informed if they do not submit a best and final offer or a notice of withdrawal, their immediate previous offer will be construed as their best and final offer. After best and final offers are received, final evaluations and scoring will be conducted for an award. Award shall be made to the responsible offeror whose proposal is determined to be the most advantageous to the State considering price and the evaluation factors set forth in the RFP. Once the Procurement Officer or evaluation committee has completed its final evaluation and has made a recommendation for award, the Procurement Officer will document the recommendation of award for the procurement file. Refer to Section 4.7.2. A copy of the executed contract resulting from the request for proposals. If a person requests to inspect portion(s) of an offeror’s proposal designated as confidential pursuant to HAR §3-122-46(9), the inspection shall be subject to written determination by the respective attorney general or corporation counsel for confidentiality in accordance with HRS 92F. If only one responsible offeror submits an acceptable proposal, pursuant to HAR §3-122-59, award may be made if the Procurement Officer determines that the price submitted is fair and reasonable, and other prospective offerors had reasonable opportunity to respond or there is not adequate time for a re-solicitation. If any of these conditions are not met, the offer may be rejected and either a new solicitation may be conducted, the procurement may be canceled, or the goods, services, or construction may be procured using an alternate procurement method. The criteria for pre-qualification of offerors, design requirements, development documents, proposal evaluation criteria, terms of the payment of a conceptual design fee, or any other pertinent information shall be stated in the request for proposals. Note: A pre-proposal conference shall be held fifteen days prior to proposal submission for construction projects $500,000 or greater or design-build projects $100,000 or greater. 1. ⇧ Solicitations posted on an eProcurement system satisfy this public notice requirement.